Some have erroneously made this statement into “she is the mother of all Harlots”, as in, she is more of a whore than any other whore. But that is not what this verse is saying in my opinion. To me, this verse is saying that her daughters are…harlots. Later in Revelation 17 we learn that she herself is a prostitute. As mentioned earlier, Mystery Babylon is a city. That seems abundantly clear and is mentioned several times in these passages. It appears that John didn’t want anyone to overlook this fact. Mystery Babylon is a CITY. The prophet Ezekiel spends an entire chapter describing how God Himself built up, educated, and cleansed Jerusalem, only to have her then lust after sin and worship strange gods. Because of these actions, Jerusalem is described as a filthy whore—cause and effect. In my opinion, for a city to be considered a “harlot”, then much of the city’s population would have to be considered harlots. I think that is what is in view here. The inhabitants of Mystery Babylon commit harlotry through sin, and especially through the worship and idolizing of strange gods. Like a weird talking statue of a man being ‘worshiped’. To my knowledge there is only one place the prophets were said to have been killed in—Jerusalem. In fact, Messiah actually says it is impossible for a prophet to be killed ANYWHERE other than Jerusalem! Now we know that Jerusalem is the city where the Prophets are killed, but Revelation 18 goes on to say that the blood of the “saints, and of all who have been slain on earth” are in Mystery Babylon. So, is there anywhere in scripture that points to a city that is responsible for the blood of the saints and all who have been slain on earth? In my opinion, there is. It is in the same discourse that we just read in Luke, but now let’s read from Matthew’s account and let’s switch to the New Living Translation. As a result, you will be held responsible for the murder of all godly people of all time–from the murder of righteous Abel to the murder of Zechariah son of Barachiah, whom you killed in the Temple between the sanctuary and the altar. I tell you the truth, this judgment will fall on this very generation. In the interest of time, I am going to move on, but I would point the viewer to Zechariah 14:1-5 in accordance with Revelation 16:18-21, Zechariah 13:1-9, and Ezekiel 5 as a few additional scriptures pointing to Jerusalem as having significance in the “end times”. For instance, in Zechariah 14 we learn that the first place the Lord’s feet will touch upon His second coming will be the Mount of Olives. Which is in Jerusalem. I would also point out that the two witnesses preach in Jerusalem. If Mystery Babylon is Rome or Mecca, why wouldn’t the two witnesses go there? Instead, we are told that they are killed “where also our Lord was crucified.” Jerusalem. Let’s get back to our Mystery Babylon study in Revelation 18. I think the best way to analyze the last two descriptions of Mystery Babylon—that she makes her merchants rich, and the kings of the earth commit sexual immorality with her—is to analyze what the merchants of Mystery Babylon are selling. The first thing that I would point out is my belief that the items sold by these merchants are very significant. There are 28 items mentioned as being sold in Mystery Babylon. I don’t think these items are just selected at random. They appear to be specific items—items used in the sacrificial system and temple services. Let’s break into the text at the first items mentioned. In 1 Chronicles 29:2, where King David is describing to the congregation all of the things that he has stored up for his son Solomon to use in making the house for God—Solomon’s temple. In 2 Chronicles 32:27…nothing too revealing here. This is just describing King Hezekiah’s wealth. And then the only exact match to the phrase “gold, and silver, and precious stones” is found in Daniel 11:38. This just can’t be a coincidence in my opinion. The only exact match to the phrase is where Daniel describes Antichrist as being honored with gold, and silver, and with precious stones. …. of pearls, and fine linen, and purple, and silk, and scarlet – The phrase “fine linen, purple, and scarlet” is one of the most used phrases in the book of Exodus. 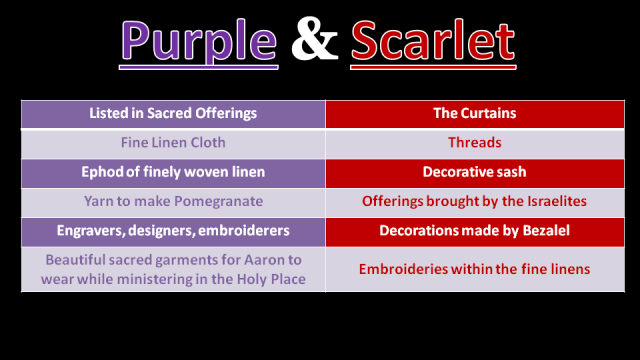 Fine linens, purple and scarlet were used for about everything that was made of cloth in the service of the Tabernacle, such as the curtains, dividers, and veil, as well as the priests’ garments and many other things. A simple word search reveals that these words “fine linen, purple, and scarlet” are only used together in two books of the Bible. Here in the book of Revelation, and 23 times these words are grouped together in the book of Exodus. Now let’s focus in on the word “silk”. Silk is a very rare word in the Bible. This is the only time it’s used in the New Testament, and it is only used 3 times in the Old Testament. The first use of the word “silk” is in Proverbs 31:22. Nothing we can really garner there. But the two other uses of the word silk are both found in the 16th chapter of Ezekiel. This is the chapter that we discussed earlier, where Ezekiel just eviscerates “harlot Jerusalem”. Thyine wood – There are no other mentions of thyine wood in the Bible. Other translations use the terms citrus wood or scented wood. This wood was said to be used as incense on account of its fragrance. I would also note that this name ‘thyine’ is derived from the Greek word ‘thuein’, which means ‘to sacrifice’. Vessels of Ivory – I would not consider ivory to be a rare word in the Bible, but it is not used very much. This is the only use of the word “ivory” in the New Testament. There are 12 instances of the word being used in the Old Testament. Ivory is mostly used in Kings and Chronicles, where Solomon and other Israelite Kings are described as having houses and thrones made of ivory. This is probably where we get the phrase “ivory towers”. I would note: Ivory is one of the items that the ‘Merchants’ of Tarshish and Hiram bring to Solomon during the time period that could only be described as the height of the Kingdom. The best of times, where silver is said to be nothing because there is such an abundance of it. Precious wood, and of brass, and iron, and marble – Outside of Revelation 18, the only other time in the entire Bible where these words are used together is in 1 Chronicles 29:2, the same verse mentioned earlier where King David is listing the items that he has gathered for the building of the Temple. This is this verse that I believe points to Exodus 29-30 again and again. Exodus 29 and 30 are all about setting up the temple services and the daily offerings and sacrifices. Cinnamon – This is a very rare word in the Bible. It is only used 3 other times, all of which are in the Old Testament. In Songs of Solomon 4:14, in Proverbs 7:17 where an ‘adulterous’ woman spices her bed, and in Exodus 30, where it is a part of the recipe for the holy anointing oil described in verses 23-25. Odours – Odours is used 6 other times in the New Testament—four times this word is translated as incense, and twice it is translated as “odours”. The word “incense” is used some 19 times in the book of Exodus. Seven of the 19 uses of the word occur in chapter 30. Incense, of course, is an integral part of the temple service. Ointments – This word is frequently used in the New Testament, but not as much in the Old Testament. The exact word, translated from the Greek into Hebrew using the Septuagint, is only used 3 times in the entire Old Testament. In 2 Chronicles 16:14 the word is translated as “ointment”, that priests have made. In 1 Chronicles 9:30 the word is also translated as “ointment”. This verse is where the Levites have made an ointment for use in the Temple, and the third use of the word….you guessed it…Exodus 30:25, where it is translated as “compound” in the KJV. This compound is used in the same holy anointing oil that the cinnamon was used for. Frankincense – Frankincense is used one other time in the New Testament. The other instance is in the second chapter of Matthew, where the Magi offered Frankincense as one of the gifts presented to the newborn Messiah. The word Frankincense is fairly common in the Old Testament, but the first time the word is used in the Bible….yep.… Exodus 30:34 where it is included in the recipe for the incense to be used in the Tabernacle of Meeting. Frankincense is most commonly found in the book of Leviticus, where it is used in a number of ways as a part of the Temple service performed by the Levites. So if one does a word search for “wine, oil, and flour”, it returns four instances where these words are grouped into a single verse. Two of them we know of—Revelation 18:13 and Exodus 29:40. The other two groupings are Leviticus 23:13 describing the ingredients needed for a meat offering, and 1 Chronicles 9:29 where items of the tabernacle are being overseen by the Levites that King David has put in charge. Once again, all of these scriptures point to temple service and offerings and sacrifices made to the Lord. This is a good time for me to also make mention of one of my other theories on this subject. I believe that the temple used for the daily sacrifice, that the apostle Paul himself called “the temple of God” in II Thessalonians 2:4, will be a temple that includes the actual Ark of the Covenant, the alter of incense, the showbread table, and all of the other original artifacts from Solomon’s temple. This is absolute speculation on my part, but I feel that is the only way a temple set up by those that reject that Jesus is the Christ would be considered “the temple of God” by the apostle Paul. And wheat, and beasts, and sheep… – I will also take this together as a group. In Ex 29:1-2 we learn that wheat and beasts (in the form of bulls), and sheep (or rams as some translations render it) are used as a part of the service or process to consecrate and cleanse the sons of Aaron for their role as priests in performing the daily sacrificial services, among other things. One should note the specification of wheat here. Not just flour. Wheat. Just as it is specified in Exodus 29:1-2. Horses, and chariots – At this point in verse 13 of Revelation 18, we take a bit of a turn in my opinion. John moves on from pointing to Exodus 29-30 and the sacrificial system, to once again connecting Mystery Babylon to the “Golden Era” of ancient Israel. The time of Solomon’s rule as king where silver was said to be as common as stones. In I Kings 10 we read about King Solomon importing and storing up horses and chariots from the land of Egypt. This not only further makes the case for absolute opulence and abundance in Israel, but also starts to outline some of the practices that lead to Solomon’s eventual downfall. Let’s first read the verses that I am referring to, and then I will explain why I believe these verses foreshadow Solomon’s downfall. Solomon’s ultimate failure and downfall was of course the building of houses for the worshiping of his foreign wives’ false gods. I am not disputing that. I am just pointing out, that in the chapter just before we read about the ultimate downfall of Solomon, we read about him focusing on material goods and losing focus on what brought him such wealth—adherence to the laws of God. By storing up horses for himself, Solomon was breaking one of God’s laws found in the book of Deuteronomy. The importing of mules was also a breaking of God’s law to not breed animals outside their own ‘kind’. Mules were not found in Israel until Solomon and his father David started importing them. Of Latin origin; a rheda, that is, four wheeled carriage (wagon for riding): – chariot. Note: Both the Strong’s and Thayer concordances define this word as ‘four- wheeled’. I think what is in view here is through its abundance and wealth, Mystery Babylon is able to store up fighting machines that are purchased from or maybe even donated from other harlot nations. But again, that is simply a theory of mine and should not be taken as anything but speculation on my part. And slaves, and souls of men – I don’t have anything to add or tie together here, other than to say that this appears to be a form of slave trade. That seems very hard to believe in the modern world, but would it be so shocking to see slaves traded during the end times? Not in my opinion. As I mentioned earlier, we will now analyze the clothes that Mystery Babylon is wearing. The purple and scarlet colors suggest wealth as we discussed earlier in this section. I would also suggest that these colors are once again pointing to temple service and the sacrificial system. 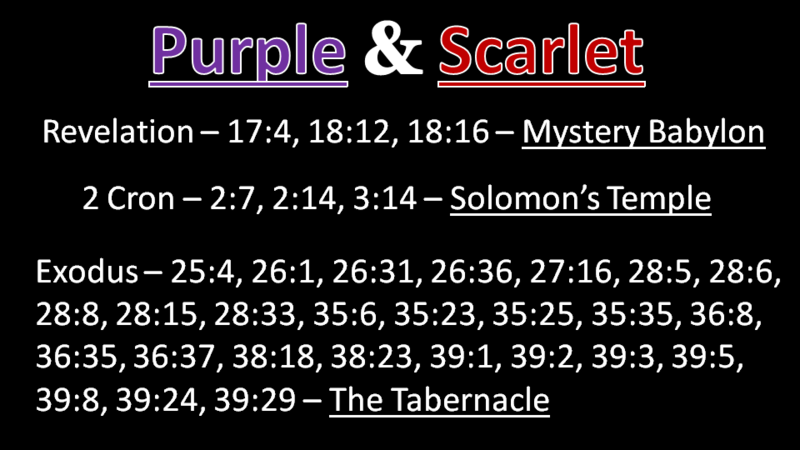 The words “purple” and “scarlet” are only found together in three books of the Bible. One of those books is, of course, Revelation. They are also used together in II Chronicles, where Solomon’s Temple is being planned and built, and in the book of Exodus, where there are some 26 verses that contain the words “purple” and “scarlet” together. The list below is a list of items in the temple and in the temple services that are commanded to be of “purple and scarlet”. I would also point out that all of these items were to also include the color blue. But blue is not found on Mystery Babylon. Why? Blue seemed to represent a covering. Purity. It was worn by the priests. It covered the Ark. It was used on the tzitzits. Every single verse that I listed above for purple and scarlet also uses blue, except the verses in Revelation that describe Mystery Babylon. The obvious absence of blue in reference to Mystery Babylon should not be overlooked. Mystery Babylon promotes and worships a false god, and therefore she cannot be decked in the purity of blue. I believe that Antichrist will pose as a Jewish Messiah. A true ‘false Christ’. He will be preceded and promoted by a true ‘false prophet’ that will claim to be Elijah, making the way for Messiah. Antichrist will fight and defeat the enemies of the modern state of Israel. He will then make Jerusalem his capital. He will declare that he has come to start his millennial reign. At this time, Jerusalem will welcome him and worship him. So will most of the world for that matter. The false Elijah will build a golden statue of Antichrist and demand that all the people of the world come and worship the statue, or face death via beheading. A great number of people will come to worship the statue, see the Ark of the Covenant, and to give offerings of gold, silver, jewels, and other forms of wealth. With all of this, the inhabitants of Jerusalem will become wealthy beyond measure. The Jews and much of the world will believe that a new Golden Era of peace and prosperity is at hand, much the same as the Golden Era of Solomon’s time. However, the two witnesses will come to Jerusalem and preach a very different message, a message that will NOT be well received. After 1,230 days of diligent preaching and calling the world into repentance for the love of sin and worshiping this false god and his disgusting talking statue, a beast (possibly the Antichrist) will kill the two witnesses. Their bodies will lie lifelessly in the streets of Mystery Babylon (a.k.a. Jerusalem) for three-and-a-half days. During this time the world will celebrate their deaths. At the end of three-and-a-half days, their bodies will come back to life and the whole world will see them ascend into the heavens. This will be number 143,999 and 144,000 of the true saints of God—the ones that will follow Messiah wherever He goes. At this point, I think a lot of Christians will wake up and know that something isn’t right. But it will be too late for them. Antichrist will be struck in the head with what the world will think of as a ‘mortal wound’. Most of the world will mourn, but the Jews will preach and expect that he will to come back to life, believing him to be their prophesied Messiah Ben Joseph. During this time his body to will lie dead in the streets of Mystery Babylon. He will indeed come back to life. I think it is at least possible that the false Elijah will perform some type of ceremony to bring him back. The Jews will somehow spin this all to say that Messiah ben David is now on the scene and the millennium has begun. After this, Antichrist will defile the ark and stop the daily sacrifice. I am not sure what reason he will give, but I do think that many Jews will realize that the jig is up at this point. Many of them will know that they have been duped. The beast will then start the worst genocide that there ever has been or ever will be. The people of Mystery Babylon will flee into the surrounding mountains trying to find a ‘place of safety’. Crying out ‘Who can make war with the false messiah?’, and begging the rocks to ‘fall on them’. And then, when all hope is drained from the earth, the King of Hope will come riding in on a white horse. The one true Savior will come and save the day. The long-awaited second coming of the King of Glory. Ok. So there you have it. There is my ‘current’ theory all laid out. Will this happen exactly as I have laid it out? NO! Of course not. Putting everything together surrounding the ‘end times’ is not easy. Let’s face it: God has sealed it up Himself…until the end. I think it’s a lot of fun to analyze, study, and discuss the end-time prophecies. But, I fear that we have stopped these discussions and debates within the Sabbath-keeping community due to fear of disagreement. What a tremendous success for Satan! He has found a way to keep God’s people from growing in knowledge out of a fear that should be easy to overcome, if we are following the commandment of our Messiah to love each other. We should therefore stay vigilant, and most importantly, we should stay ‘right with God’. That is the really important thing. Get right with God, and stay there. That’s how you become a part of ‘the elect’. If you are a part of the elect, when perilous times come, He will see you through them. He is the place of safety. He will not leave nor forsake you. He will be with you until the end. One last warning—agree with me or disagree with me. But please don’t let any of these end-time theories enter into your core beliefs. Theories don’t belong there. P.S. : This was written as a narration to a video I produced in 2015 and adapted to this format. I am currently creating a new Antichrist video that is born out of a new Antichrist theory that is my own. Stay tuned.